2. What is an API? Ebay is one of the biggest ecommerce sites. Many people use it to search and buy products, and many stores use it to enlarge their audience and expand their business range. If we want to operate programmatically on Ebay, for example to mass create or modify a set of items, or quickly confront prices, we must use the dedicated application programming interfaces. In this tutorial we will see how to prepare our working environment in order to use python to interact with the Ebay APIs. What is the Ebay sandbox and how create a sandbox user. How to obtain the Ebay python SDK. Other Knowledge of the python programming language and of the basic object oriented concepts. API is the acronym of Application Programming Interface. You can thing about an API like a set of programming instructions and procedures which allows a software to connect to a third party service, which provides methods to programmatically perform some kind of tasks. In this series we will see how to use python to interact with the Ebay APIs, in order to perform operations like searching for items or retrieving detailed informations about them, creating insertions or retrieving statistics about most watched items. In this first article we will see how to create a developer account and generate our API keys, how to create sandbox "test" user, and how to obtain the Ebay python SDK. The first thing we must do, is to create a developer account, in order to obtain the credential which will be included in the API calls to authenticate us. 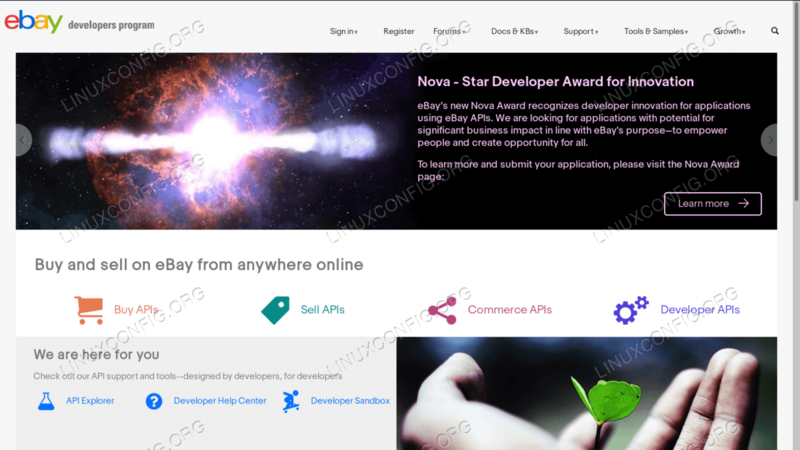 Navigate to the Ebay developers program website and click on the register voice in the navigation menu. You will be prompted to fill a simple registration form; after you send the information, you will receive a confirmation email. Once the account is successfully created and confirmed, you can proceed and access the developer website's functionalities. To generate your API keys and credentials you can navigate to the my keys page. Here you will notice that you can generate keys for both the sandbox and production environment. The first is a sort of copy of the Ebay website, built with the specific purpose of letting developers perform tests in a safe environment, without having to worry about damaging a real store. The production environment instead is the "real" thing. It should be clear that keys generated for one environment cannot be used to access the other. We will later see how to declare what kind of environment we want to use in our python code. Each API key set is composed by three elements: the App ID (or Client ID), the Dev ID and the Cert ID (or Secret). To use some specific API, like the Trading API, and to interact with a store, we will also need to get a Token; we will see how to get one later, when we will explore calls related to that API. The next step is to create a sandbox test user. As said before, the sandbox is a copy of the primary site, against we can safely test our applications before moving to production. We can create one or more sandbox "test" users to simulate both buyers and sellers in a transaction. 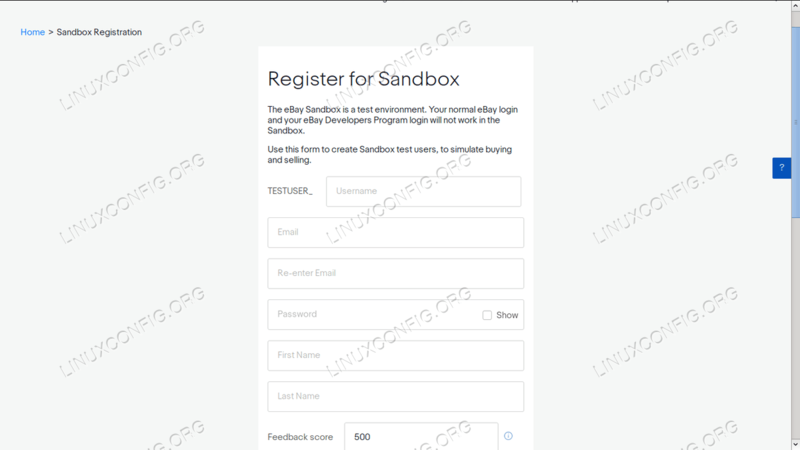 When creating the sandbox user we can setup interesting parameters, like the feedback score and the registration date. In both cases we used the --user option, to install the package for the single user, and not globally. As you see, the file is divided into sections, each containing the the needed credentials for a specific API endpoint. For example, the Finding Api credentials are referenced in the relative section, where we can see that the endpoint is svcs.ebay.com. To use the Finding API all we need to provide is the App ID we generated before. This specific API will be the first one we will explore in the next article of the series. In this introductory article, we saw how to prepare our working environment in order to use python to interact we the Ebay APIs. We saw how to create a developer account and how to generate our credentials, both for the sandbox and production environments. We also created a sandbox "test" user account, in order to safely perform our tests. Finally we saw how to retrieve the official Ebay python SDK from github. In the next tutorial of this series we will see how to perform our first calls using the Finding API: stay tuned!